200 Landscape Architect and Specifier News 2016 Specifier's Guide outdoor living Pergolas / Panels Pergolas (Continued on page 202) See Ad on page 197 Information Request # 9497 Parasoleil 303-589-4524 parasoleil.com Parasoleil makes a commercial architectural panel system used to define indoor and outdoor space to be both structural and beautiful, specializing in overhead shade, screen, decorative railing, and cladding panels. Parasoleil – The Art of Shade. 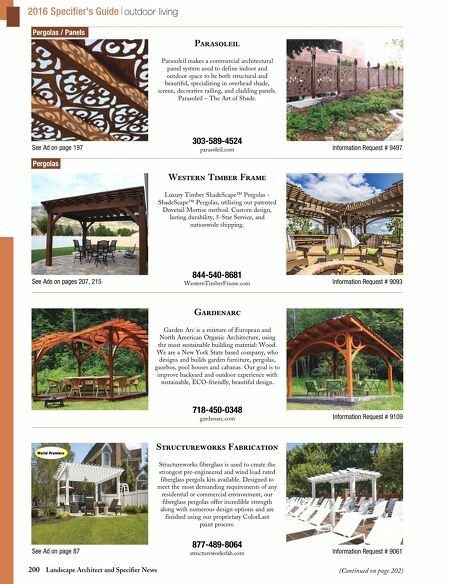 See Ad on page 87 Information Request # 9061 Structureworks Fabrication 877-489-8064 structureworksfab.com Structureworks fiberglass is used to create the strongest pre-engineered and wind load rated fiberglass pergola kits available. Designed to meet the most demanding requirements of any residential or commercial environment, our fiberglass pergolas offer incredible strength along with numerous design options and are finished using our proprietary ColorLast paint process. World Premiere Information Request # 9109 Gardenarc 718-450-0348 gardenarc.com Garden Arc is a mixture of European and North American Organic Architecture, using the most sustainable building material: Wood. We are a New York State based company, who designs and builds garden furniture, pergolas, gazebos, pool houses and cabanas. 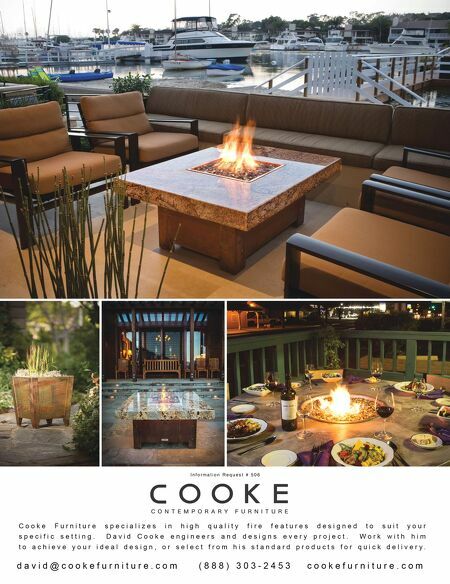 Our goal is to improve backyard and outdoor experience with sustainable, ECO-friendly, beautiful design. See Ads on pages 207, 215 Information Request # 9093 Western Timber Frame 844-540-8681 WesternTimberFrame.com Luxury Timber ShadeScape™ Pergolas - ShadeScape™ Pergolas, utilizing our patented Dovetail Mortise method. Custom design, lasting durability, 5-Star Service, and nationwide shipping.